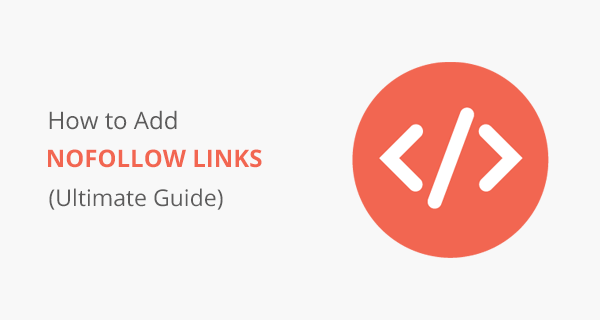 Wondering how to add nofollow external links to your website? This ultimate guide will help you add a nofollow attribute to any external link on any platform. Please select your CMS platform below to get started. To manually add a nofollow link, go to your WordPress editor. Switch to HTML post editor by clicking “Text” at the top right corner of WordPress post editor. Now find text or an already anchored link in HTML post editor. That’s it! Replace as many external links into nofollow links using the above method. If you want to create backlinks for your website then make sure to check out these best free link building tools as well. This is easier than the above method, so I would recommend it. Install Title and NoFollow for Links plugin on your WordPress site. Now add a link in your post/page like you would normally do. Click on the little gear icon in the insert link area. This will bring up advanced insert link popup. Add a rel="nofollow" attribute in your HTML anchor link. Go to your Shopify page/post editor. Click on this </> icon at the top right corner of your text editor. Find the external link that you want to make nofollow link. When you add an external link on your Shopify site, make sure to add a nofollow attribute for good SEO. Google and other search engines will not follow this external link. If you want to increase sales on your Shopify website then make sure to interlink all your pages and add a nofollow attribute to external links. Joomla is quite an SEO friendly platform. There are a lot of extensions to help you do things which are difficult for an average user. You can add a nofollow attribute to links manually or use an extension to make that task much easier. Install this Marco’s Nofollow extension on your Joomla website. This extension will automatically add a rel="nofollow" attribute to all external links. You don’t have to add anything else. Drupal by default set all the external links to dofollow. If you want to add a rel=”nofollow” attribute to particular external links, then you can do it by adding a rel=”nofollow attribute in your HTML. However, this could be time-consuming, especially if you want to add a nofollow attribute to all of your outgoing links. You can do it simply with the help of Noindex External Links Drupal Module. 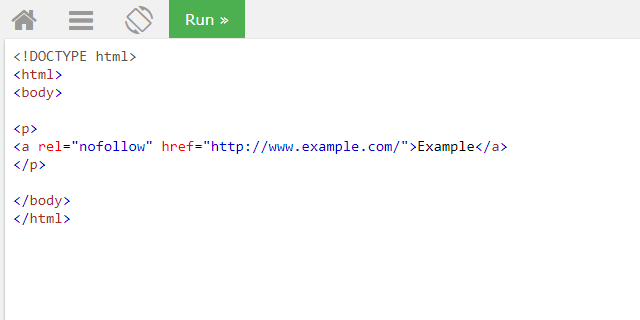 This module will add a rel="nofollow" tag to all external links on your website. You can try that method or you can use an old-school method by adding a rel="nofollow" attribute to the links that you want to set to nofollow. This is the only method that I could find when I needed to add nofollow links to my client’s Weebly blog. If you want to try this method, then you have to ditch the normal post editor given by Weebly, instead use Embed Code option to write a post in HTML. Here’s how to add a nofollow attribute in your Weebly blog. Go to post editor in weebly. Click on the Embed Code option. Now start writing your post as you usually do. Now your post external links will have a nofollow attribute and you can check that by using inspect element tool. Wix doesn’t provide built-in support for nofollow links at the moment. However, they may add this feature later. It is an important feature to improve your Wix website SEO. Go to your blog post editor in Wix. Start writing whatever you want. To add a nofollow external link to your post, simply switch to HTML code editor box by clicking on </> HTML. Now add your links manually by using HTML <a> tag. Adding this code will hopefully make those links nofollow. You can check that by using inspect element tool in your browser. I hope by reading this post you have a general idea of how you can add a nofollow attribute to an external link. If the platform gives you the freedom to change the HTML code, then you can add a rel=”nofollow” attribute to an external link. If you find this article useful, then don’t forget to share it. Also if you want to buy quality backlinks services for your website, please feel free to message me. Comfortably, the article is in reality the sweetest on this precious topic. I fit in with your conclusions and will thirstily look forward to your incoming updates. Saying thanks will not just be adequate, for the extraordinary lucidity in your writing. I will directly grab your rss feed to stay informed of any updates. Gratifying work and much success in your business dealings!